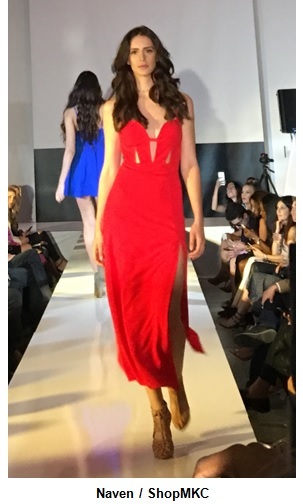 ShopMKC (the multi-line retailer with brands in apparel, shoes, accessories and cosmetics) held a fashion show in Orange County to benefit the amazing Boys Hope Girls Hope nonprofit. This organization helps children in need to meet their full potential by providing homes, opportunities and education through college. The bustling event featured a runway show highlighting the many fashions you can find on ShopMKC's site. I noticed a major trend of these collections was the cutout. The print on this Prey Swim bathing suit is fantastic! This line is designed by Audrina Patridge. Here it is in a gorgeous bronze metallic color. It's even reversible! The final look of the Prey Swim collection was modeled by the designer's own sister, Casey Loza. This hot pink minidress by Naven was made even more fun with chic cutouts. This blue one-shoulder dress had a modern feel with the side cutout. The midi length of this dress was chic, paired with the side slit and architectural cutouts. From flirty to feminine, cutouts can give any look that little something extra - and they don't always have to expose a lot of skin!